← 2017 CGOA Conference Afterglow! 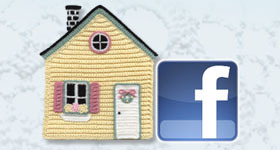 Have you seen the new Caron Cakes yarns? I think they’re only available at Michaels Craft stores. They came out last year (or the year before) with the basic Caron Cakes yarn, which is worsted weight and has 383 yds. Now they have Caron Cupcakes (the ones on the far left and right with the pompoms on top in the photo above). These cakes are light weight (#3) yarn with 244 yds per cake. There is a knit or crochet hat pattern on the inside of the yarn label. The pompom will look great on the top, if I make these into baby hats! 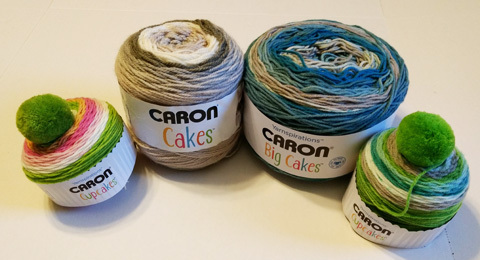 Then they have the Caron Big Cakes (the blue one in the photo), which is worsted weight, just like the basic Caron Cakes yarn (the Big Cakes looks and feels slightly thinner than the basic Caron Cakes yarn, though). The Big Cakes has 603 yds. The basic Caron Cakes yarn (the tan one in the photo) is 80% acrylic and 20% wool. The new Big Cakes and the Cupcakes are 100% acrylic. There is also a Tea Cakes and a Sprinkle Cakes, which I held off on buying this time around (what self-control I have!!!)! Here are some of the Red Heart yarns that I’ve bought. I’ve been crocheting (and designing) with the Red Heart Boutique Unforgettable for several years now (the left and right skeins in the photo above). I love the colors they have and they work perfectly for my One-Skein Cowl patterns! 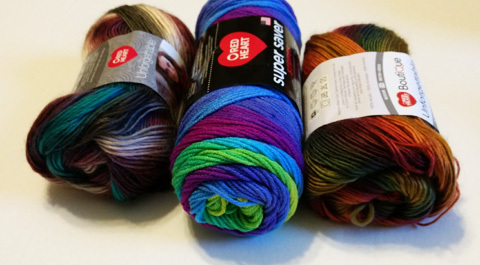 The center skein of yarn is the new Red Heart Super Saver Stripes. It is a worsted weight yarn with 236 yds (100% acrylic). I saw this yarn at my local Walmart last month and this color spoke to me! So I listened and added it to my collection of color-changing yarn! I LOVE the colors in this skein! I don’t know yet what I’ll design with it, but I will definitely enjoy the colors while I’m working with it (I love just looking at the colors in the skein, too)! This cake is the new Lion Brand Mandala yarn. I saw this yarn on the same day last month at my local Walmart. It spoke to me, too! This yarn is another light weight yarn (#3). It is also 100% acrylic and has 590 yds in it. That’s enough for a nice, drapey crochet project (probably an accessory)! Here’s a new design that I saw in the recent issue of Crochet! magazine (Winter 2017) that uses the Lion Brand Mandala yarn. 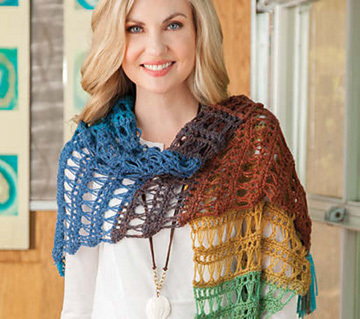 It’s designed by Karen McKenna and is made with one skein of the #216 Sphinx colorway. Isn’t it gorgeous? It’s a good thing that I like to crochet because I’ve found that acrylic yarn isn’t as good for knitting as it is for crochet! And I LOVE getting lots of yardage for my money, too! I’m looking forward to designing some delicious crochet patterns with these yarns! What draws you to a particular yarn? Is it the colors, like me? Is it the fiber content? Is it the yardage? Is it the price? Or is it something else? I hope you’ve enjoyed seeing these new yarns. And I hope I haven’t enabled you too much to buy more yarn than you’ll ever use in your lifetime!!! 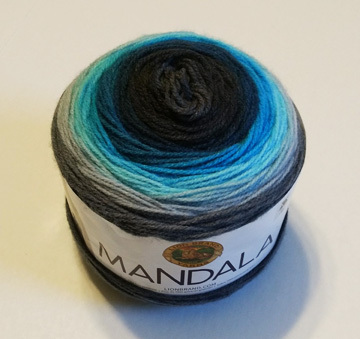 This entry was posted in Yarn review and tagged color-changing yarns, yarn. Bookmark the permalink.